Widget contains definitions of popular CSS values. Is there a better alternative to CSS Reference? Is CSS Reference really the best app in Network category? Will CSS Reference work good on macOS 10.13.4? 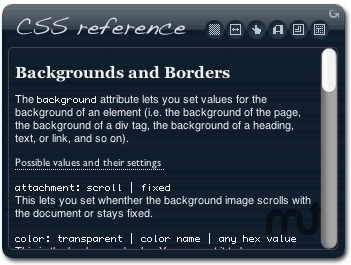 CSS reference contains complete definitions of the most popular CSS values, along with syntax and variables. You can easily switch among the six section by using the buttons at the top. CSS reference is a work in progress, and we have not yet implemented some values. If you like it, please contribute to the project by adding your own values. CSS Reference needs a rating. Be the first to rate this app and get the discussion started!